Here’s a confession: I’ve always dreamed of writing a Filipino-American novel. I have no clue what it will be about, or even what genre it would be in, but I knew I wanted the protagonist to be Filipino, and I wanted it to resonate somewhat with readers beyond other Filipinos. Here’s the reason: As a Filipino-Canadian bookworm and aspiring novelist, I’m dismayed by the apparent lack of books with Filipino characters or Filipino content in the mainstream literary world. With the notable exception of Jessica Hagedorn’s Dogeaters (published over a decade ago – in 1991), there aren’t a lot of contemporary examples of fiction written by Filipinos and published or read outside the Philippines. Some of the others I know of are either about the country under Martial Law (relevant history, but still far from contemporary), or written by non-Filipinos (still notable, as in the case of Angie Abdou’s recent novel Between, but not quite the same). I should add here that it’s entirely possible I just don’t know of these examples, and I would love, dearly love, to be proven wrong about this. 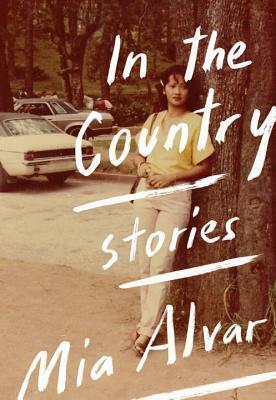 Here’s another confession: Alvar’s stories could have been just okay, and I still would have been liked the book, because as I mentioned, I’m starved for contemporary Filipino American literature. So imagine my thrill when I read the first story and realized Alvar’s writing is so much more than just okay — it was brilliant! Her stories indeed “vividly give voice” to her characters, transporting the reader to locales such as Dubai or New York and describing events such that you can actually feel like you’re there. Her characters range from household helpers and young professionals in the 80s and 90s to activists in 1970s Martial Law. Filipino-ness is intrinsic and integral to her characters, without necessarily determining their stories, and references to Filipino cultural nodes like sari sari stores and telenovelas are sprinkled throughout, again intrinsic and integral to the stories without quite being the driving force. I guess that by that I mean that Alvar’s writing doesn’t quite set out to push Filipinos to the forefront, but rather takes the stories that are there and simply shares them with the world. Given how many Filipino-American stories seem fixated on Martial Law, I found myself more drawn to her tales of Filipinos working in other countries. OFWs (Overseas Filipino Workers) form a significant part of the Philippine economy and population, and Alvar’s stories do a great job of presenting the balancing act between being away from home and forming a new home wherever you are. I love the simplicity of that notion, that stubborn clinging to a language because it’s the one bit of home that you can keep, no matter what. I love it mostly because I understand it, because I understand the sense of home that can come just from hearing the sharper cadence of your language. It’s this sense of home that I felt while reading Alvar’s stories, the sense that while the experiences she recounts are not quite my own, there are touchpoints and trademarks that resonate with familiarity. I read this collection on a train out of town one weekend, and for once, I actually wanted the journey to last longer so I could keep reading. One question I have every time I read a book that resonates with me because of something in my background (e.g. Crazy Rich Asians), I wonder if non-Asians or non-Filipinos would respond in the same way. Is the book great just because I found familiarity within it, or would other readers also find something within it that will resonate with them? And part of me always hopes so, because that would mean that something in Filipino culture, or Asian culture in general, something far beyond the stereotypes that unfortunately are all too prevalent in books and movies, touched a chord in a broader readership. So far, I’ve lent In the Country to one non-Filipino friend, who also loved it and thought the writing was really good. Call me silly, but that response actually made my day. In case you couldn’t tell, I absolutely loved Mia Alvar’s In the Country. Here, finally, is the book I’ve long wanted to read and, to be honest, also wanted to write. I still dream of someday joining Alvar and Hagedorn and a hopefully growing list of Filipino fictionists who have carved a space of our own in the Western literary world. In the meantime, I’m beyond glad that Alvar has written this book, and I can’t wait to see what she writes next. A note that at the beginning of this year, I made a pledge to read more Asian American Women Writers. I will likely do a brief recap list nearer the end of the year rather than individual reviews for all of them, but it’s thanks to this pledge that Lynne from Words of Mystery passed this book on to me. If you’re interested in reading more works by Asian American women, here’s the shelf I created on Goodreads, based off of Celeste Ng’s original article. And if you have any recommendations to add to this list, in particular of Filipino writers, let me know! I’m always on the lookout for more. This entry was posted in Book Reviews and tagged 50BookPledge2015, Asian American Women Writers, Fiction, Filipino, Filipino American, Random House, Short Stories by Jaclyn. Bookmark the permalink. I love reading books by and about Asian Americans, but now I’ve just been reminded I don’t read any by or about Filipino Americans specifically. I remember seeing In the Country on the new releases shelf at Barnes & Noble months ago, but I completely forgot about it until now. Thank you for this post and your commentary. The passage you selected particularly resonated with me as a leader in the Filipino American community at my own school, trying to guide my peers through balancing their Filipino and American identities.